This is easy and done in less than 15 minutes from start to finish which means you can whip this up in less time than it takes for the rice in your electric rice cooker to cook. This application is great with fish steaks or fillets. But I can see large prawns in this as well. In a medium skillet, fry 2 tablespoons of red curry paste in 1/2 cup of coconut milk “head” (the thickest part that rises to the top of the can) over medium-high heat until the coconut milk splits. Add 2 large fish steaks (I use halibut here, but salmon works great too), reduce heat to medium, and cover. 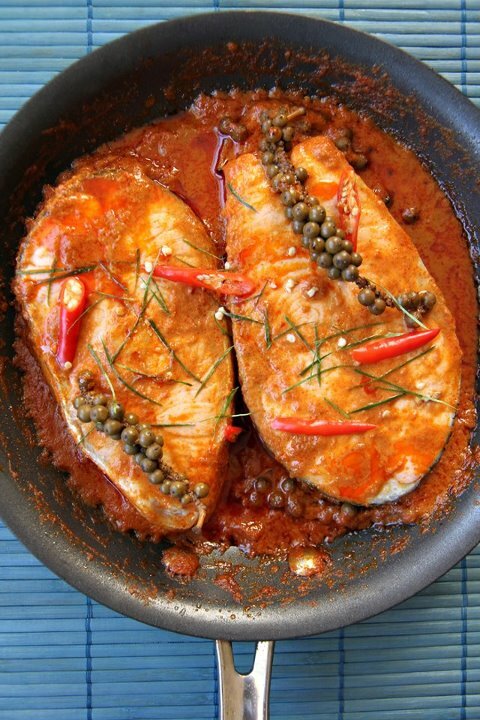 Once the fish steaks are cooked on one side, flip them. Season the sauce to taste with fish sauce and a small pinch of sugar. Add a few sprigs of young green peppercorns (brined, if can’t find fresh) and sliced red jalapenos. Continue to cook over medium, covered, until the fish is cooked through. Take the skillet off the heat. Sprinkle with fine strips of kaffir lime leaves. Serve on rice. This looks lovely; I often struggle to find tasty fish curries that don’t overwhelm the flavour of the fish but this looks great. Fresh green peppercorns are one thing I just haven’t been able to come across, although I have been developing a relationship with a farmer on facebook who I think might be able to help me out. 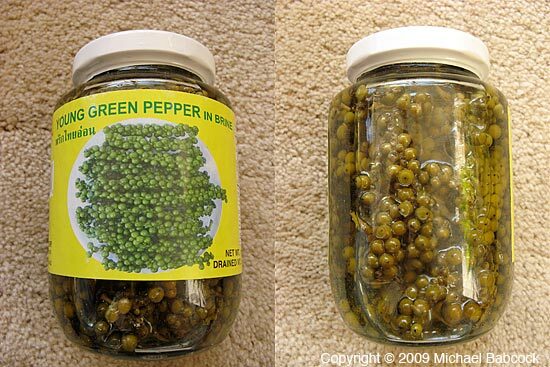 This looks and sounds amazing, I am a pepper freak and I’ve never ever tried green peppercorns. I usually cook fish in such light sauces that this is a nice change for me. Awesome dish! I am drooling now. What’s missing is a bowl of rice to go with this. This looks really good! And I bet a semi-sweet Riesling with a touch of peach & citrus would make a great match with your recipe. I made this tonight, and it was marvelous. I used salmon and simmered green beans in the sauce for two minutes to make an easy side-dish-within-the-dish. This plus a can of beer made for the perfect dinner for two, and it was quite beautiful as well. One issue: I’m not really sure how long to cook the fish. The meal took 25 minutes to cook from start to finish and the salmon was still a tiny bit underdone for my tastes. How do you know when the fish is ready? Also — I couldn’t find green fresh peppercorns so I used pink peppercorns. What do fresh peppercorns taste like? Are they significantly different from regular peppercorns? Thanks for another wonderful dish! Thanks for the report! In most recipes, the cooking time can only serve as a guide. This is due to many factors (heat, pan diameter, pan depth, height of pan sides, thickness of fish, etc.). The standard protocol for fish is to cook until you can flake it (especially the thickest part or the part that’s attached to the spine bone) easily with a fork. I usually take it off the heat about a minute before it gets to that point as the residual heat will take care of the rest and ensure the fish isn’t overcooked. Next time you make this, be sure to use salmon that’s been cut the same size, the same pan, the same heat level, and cook it a bit longer (2 more minutes on each side?). That should do it. Don’t worry about the green peppercorns. You can just leave them out. They’re the young, juicy version of black peppercorns that pack less heat and have a pleasant berry-like (albeit firmer) texture. You can get them online if your local Asian grocery store doesn’t have them. They come in a glass jar, brined. FRESHLY SNIPPED KAFFIR LIME LEAVES!!!! Yay!